Metaboss Gives Facebook Group Ownership Experience: Not too long ago on the active Facebook group Homeless Handicappers, a member suggested they get together and buy horses. 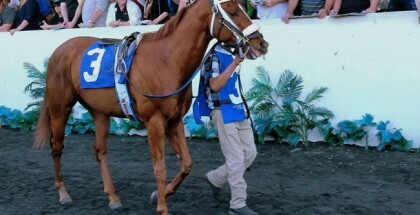 Racehorses, even the cheaper ones, are expensive to maintain and most fans never get a taste of owning one. Plans progressed though and under the leadership of head moderator Michael J. Arndt they purchased an interest in Metabosss, as well as other horses. Metaboos, pictured above on January 4, 2015, gave his inexperienced owners a thrill while breaking his maiden over turf at Santa Anita Park. Over a week ago, the three-year-old Street Boss colt that cost 60k at auction gave his inexperienced owners a thrill while breaking his maiden over turf at Santa Anita. Racing in mid-pack, Metaboss saved ground for most of the race under jockey Rafael Bejarano while opponent Rockin Robin set a moderate pace. Turning for home, track announcer Trevor Denman remarked that Metaboss “needed somewhere to run” and Rockin Robin began to slip away. Arndt worried shortly, but soon felt confident. After mowing down the pacesetter, Metaboss improved his overall record to 4-1-1-1. 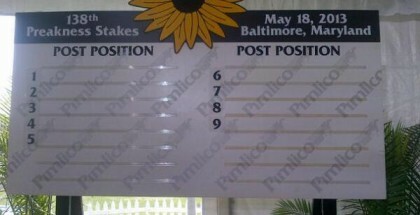 Metaboss’ previous losses involved talented runners. 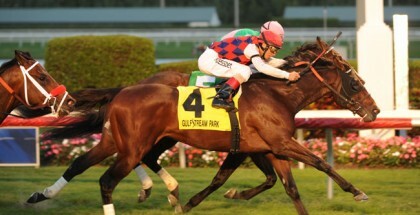 In the colt’s third start, the race featured Bolo, a promising horse that crushed the Eddie Logan S. next time out. Before that, Metaboss lost the Juvenile Turf Sprint S. on the Breeders’ Cup undercard against Ocho Ocho Ocho, who went on to win the G3 Delta Jackpot. 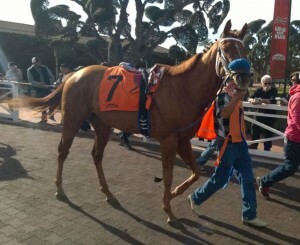 Even Metaboss’ career debut featured a horse named Stormy Liberal that placed in a graded stakes at Del Mar. The tough competition gave the young colt some good experience, should the connections decide to tackle similar horses in the future. One excited poster even suggested Metaboss might point towards the Belmont Derby, but Arndt and partners Daniel Press, Mersad Metanovic and S.M. McFetridge will play conservatively for now. Arndt warns not to take everything written inside Homeless Handicappers as official Metaboss updates. To be clear, Arndt and his loyal followers own a very small percentage in Metaboss. But their enthusiasm remains the same, especially since Metaboss runs in the official silks of Homeless Handicappers with “HH” proudly displayed on front. Metaboss related posts appear daily on Facebook now. A recent discussion point among members questions the usefulness of the 76 Beyer Speed Figure awarded to Metaboss’ maiden win (many think the number should be higher). One commenter wrote how even Andy Beyer questions his own numbers for turf races. In any case, Metaboss sparked the group into bonding behind their horse. Arndt, who runs the company Digital Hearing Outlet, sticks to a rule in order to ensure the ownership experience remains positive. “I worked very hard on NOT having just anybody join this. I chose folks who tended to get along on the bulletin board, and … they are like that in real life as well,” Arndt revealed. When asked whether owning horses feels better than handicapping, Arndt does not hesitate to choose owning horses. The group leader hopes to one day breed horses and watch them run, and seemed eager to tell an inspirational story relating to this goal. “Planning the mating, watching the foal being born, watch its first steps, then grow through the different stages … wondering if it’s really ability you are seeing … then hanging on every element of its training, then that day it races for the first time … oh man, I want to do that someday,” Arndt proclaimed. For now, Arndt is happy watching Metaboss and the group’s other active horse Arlington House. After Metaboss won, he received at least 30 texts from members expressing how Metaboss’ win gave them one of the best experiences of their lives, and receiving those texts is a feeling that gambling on horses cannot duplicate. For more information on Metaboss or joining their ownership group, check out the Metaboss Facebook Page and Homeless Handicappers.